A FATHER-of-three diagnosed with incurable cancer before his 50th birthday is encouraging other men not be afraid to reach out for help. 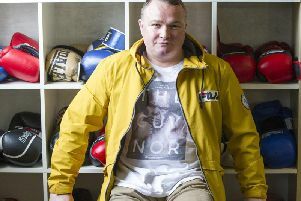 Stuart Riddell, now 53, was dealt a devastating blow in 2013 when he was told he had late stage cancer. Describing himself as a typical “middle-aged bloke” he thought cancer help centre Maggie’s was “not for him”. But when he found out his bowel cancer was at an advanced stage he knew he needed more than just medical help. He stumbled across the road from the Western General to the Maggie’s Centre, where the dedicated team offered him a lifeline when he was at his lowest. And to ensure the centre can continue to offer vital support to an additional 5000 people a year, he has organised a fundraising ceilidh to help in the Buy a Brick campaign. The Evening News has teamed up with Maggie’s for the Buy a Brick appeal, which aims to raise more than £750,000 to extend the centre. The ceilidh, held for the first time last year, raised a staggering £11,000 for Maggie’s and Stuart hopes to be able to hand over a similarly sizable cheque this year for the “incredible” centre. “There is a sense of calm reassurance from the minute you walk in,” he said. Stuart was told that although his second tumour, which was wrapped around a major artery, was treatable, the cancer was at an advanced stage. Maggie’s Centre offers tailored men’s group sessions which helped Stuart find ways to cope with a diagnosis he had not anticipated. “All the hope that had been extinguished and ten minutes after being at Maggie’s,” he said. “I started feeling like all hope wasn’t gone but they helped me order my thoughts. The men’s groups which are run once a week offer a space for people to talk to others who are in a similar situation, to share experiences and to express emotions. “I suspect there is a reluctance on the part of many men to go in and talk about their feelings,” Stuart said. The centres also offer art groups, rest and relaxation classes, benefits advice and for Stuart the nutrition classes really gave him a practical focus. Support from his wife Alison, and children Duncan, 22, Louise, 20, and Claire, 16, helped pull him through and the whole family is involved in fundraising for Maggie’s. Stuart was diagnosed after grumbling in his stomach turned to more severe pain, followed by a rapid weight loss. An emergency scan revealed he had two tumours, only one of which they could remove. He underwent a major operation two days later before enduring six cycles of chemotherapy followed by five weeks of chemotherapy and radiotherapy. But he has now reached an unexpected milestone – three years since the end of treatment. “I actually I didn’t expect to get here so I am extremely lucky,” Stuart admitted. “The fear is always in the back of your mind but I learnt to keep it at the back. Finding your own way to deal with it is the most important thing and visiting Maggie’s was immensely helpful.